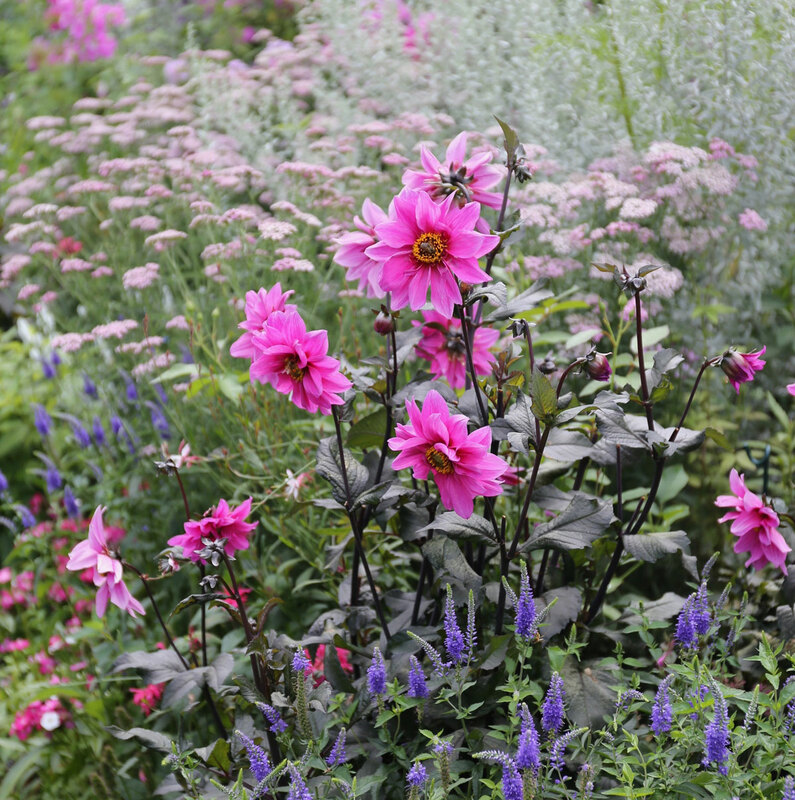 Cottage gardens are quintessentially British, yet they are also distinctly American. In colonial times, cottage gardens were about the only type of garden around. Planted right outside the kitchen door, these humble home gardens were an extension of every day life, providing herbs and other edible plants for cooking and medicinal uses. 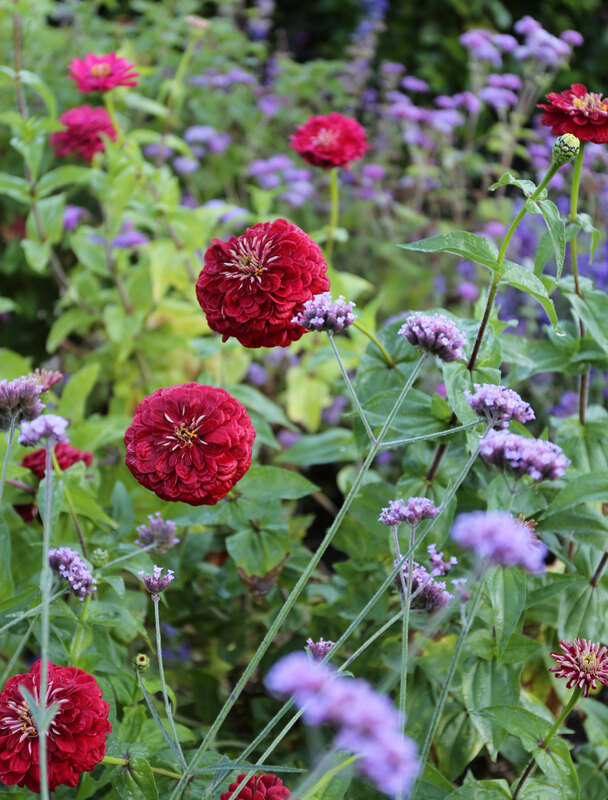 Red zinnias interplanted with Verbena bonariensis (and ageretum ‘Blue Horizon’ in the background). The American cottage garden’s origin may have been strictly functional, but gardeners will be gardeners. Before long, neighbors started exchanging slips of perennials and friends began sharing seeds of treasured annuals. These gifts would be tucked in here and there among the vegetables and herbs. Those that were easy and survived got to stay. Cottage gardens couldn’t be labor intensive, but over time they became increasingly beautiful! Thinking about how these gardens came to be, makes it easy to understand why cottage gardens look the way they do. Born of necessity, they evolved organically. And it’s this slightly haphazard, eclectic jumble that makes them so endearing. If you dream about having a cottage garden, here are seven tips to help you get the look and the feel you’re after. 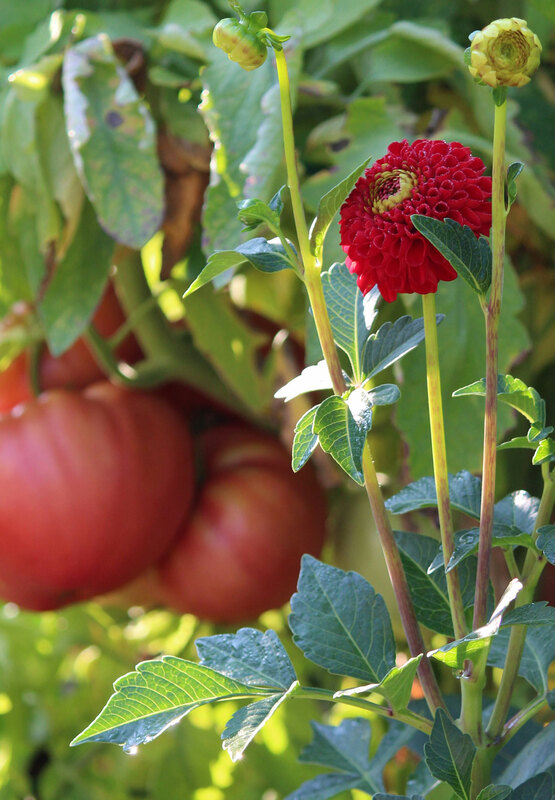 Dahlia Boom Boom Red and some beefsteak tomatoes. Cottage gardens don’t have to include edibles, but they are always richer for it. Swiss chard and kale are as decorative as they are delicious. Pole beans and scarlet runner beans are good to eat and it’s fun to watch them reaching for the sky. Cherry tomatoes glow in the summer sunshine and offer a treat every time you walk by. Consider adding fruit as well. Strawberries and currants are traditional favorites. Popular herbs for cottage gardens include dill, basil, chives, borage, hyssop, bee balm, artemisia and lavender, plus catmint, thyme, sage, comfrey and tansy. Though you may never use your herbs for dying fabric, making healing balms or brewing a restorative tea, herbs have stories to tell and they link us to a time when gardeners knew many things about plants that we have forgotten. 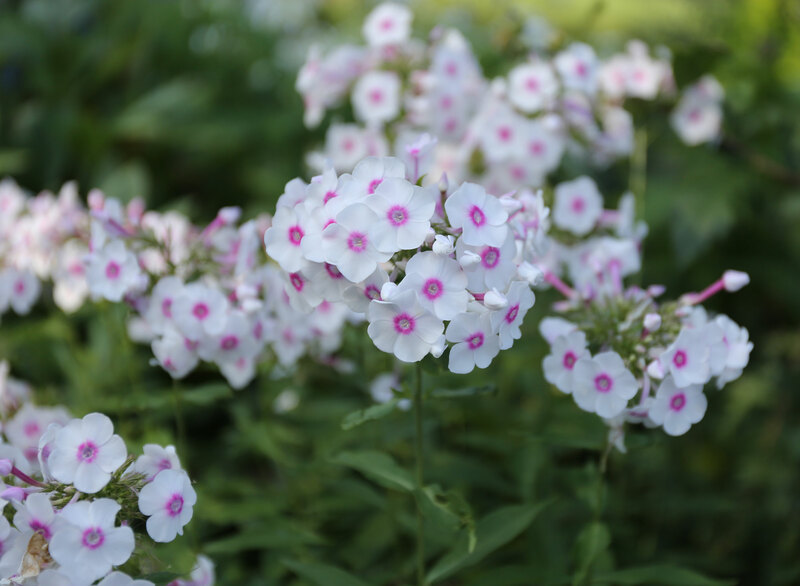 Sweet-smelling garden phlox (Phlox paniculata). Nostalgia plays a big role in cottage gardens. Flowers, and especially their fragrance, can stir memories of people, places and experiences. They may be flowers that grew in your grandmother’s garden, or flowers that grew in the yard outside your childhood home. Sometimes it’s impossible to pin down the memory. What you are feeling may simply a sense of kinship. Another reason for growing heirloom plants is that they tend to be rugged and reliable, with no need for pampering. Classic cottage garden perennials include roses, peonies, scabiosas, penstemon, campanulas, nepeta, violas and phlox. Biennials, which bloom in their second year, include sweet William, hollyhocks and foxgloves. Sunflowers with Kiss-Me-Over-The-Garden-Gate (Polygonum orientale). Annuals are equally important. 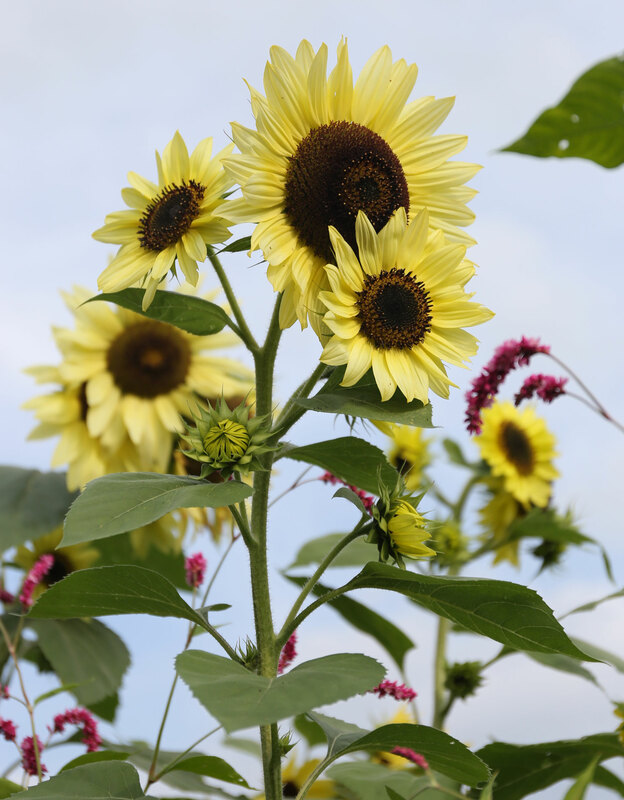 Cottage garden favorites include sweet peas, bachelor’s buttons, sunflowers, calendulas, cosmos and zinnias. 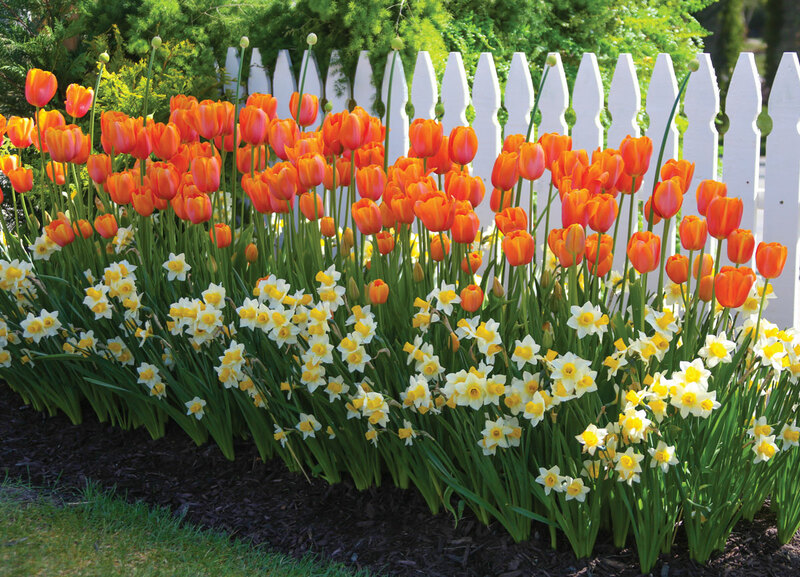 Don’t forget about spring and summer-blooming bulbs such as daffodils, tulips, dahlias, lilies and gladiolus. Roses and clematis are excellent companions. Historically, a picket fence and swinging gate served a practical purpose: to protect the cottage flower garden from chickens, farm dogs, livestock and wildlife. But fences are not just practical. They also provide a comforting sense of enclosure. Arbors, trellises and free-standing teepees are important for the same reason and allow vines such as clematis, morning glory and climbing roses to amplify the feeling of shelter and privacy. Tulip Dordogne with Daffodil Golden Echo. 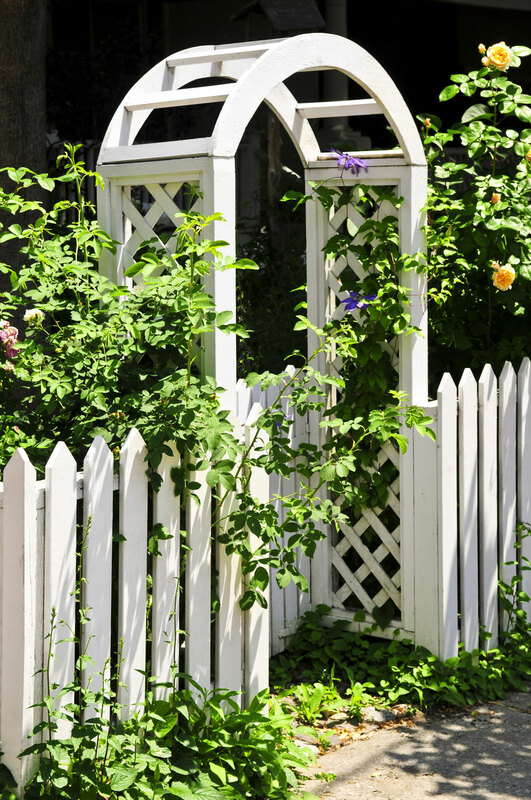 Picket fences are the traditional favorite, but lattice and wrought iron are acceptable alternatives. The fence is usually about waist height — low enough to see over and high enough to frame and help support tall plants like hollyhocks, shrub roses and kiss-me-over-the-garden-gate. White or unpainted wood will give you a classic look, while color will be more playful and contemporary. Gates are a good thing, too. Especially when they swing open easily and then close behind you with a satisfying thud. Dahlia Fascination with blue veronica, pink yarrow and grey artemisia. 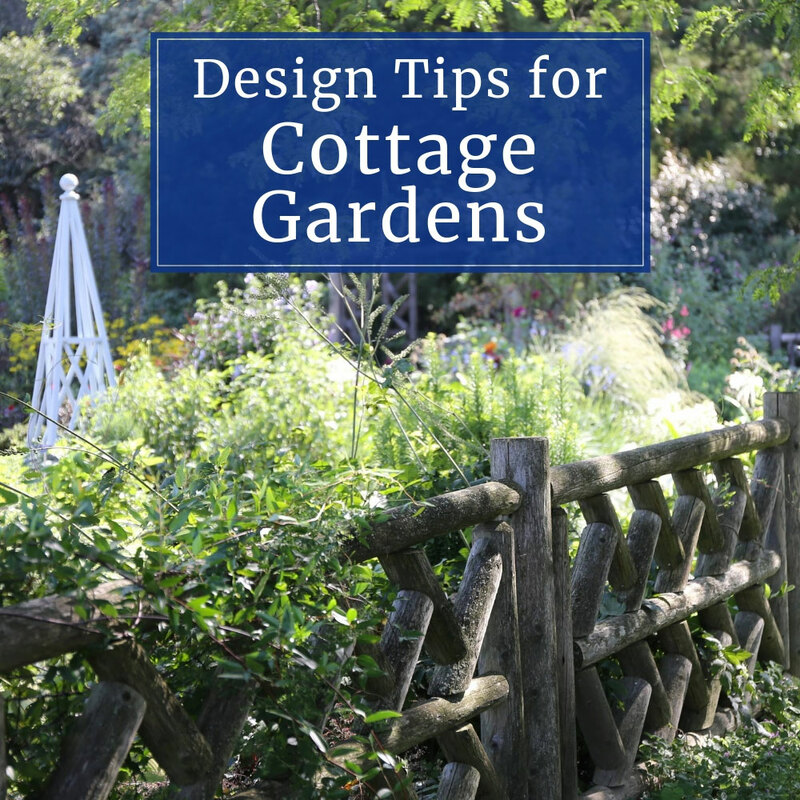 Cottage gardens typically have narrow, meandering paths and wide planting beds that are jam-packed with a tangle of annuals, perennials, biennials and vines. Within the confines of a tidy picket fence, these plants are free to express themselves, reaching, spreading, cascading and flopping as they wish. Self-seeding plants are a must. There’s no telling where they will pop up, and this serendipity is all part of a cottage garden’s charm. 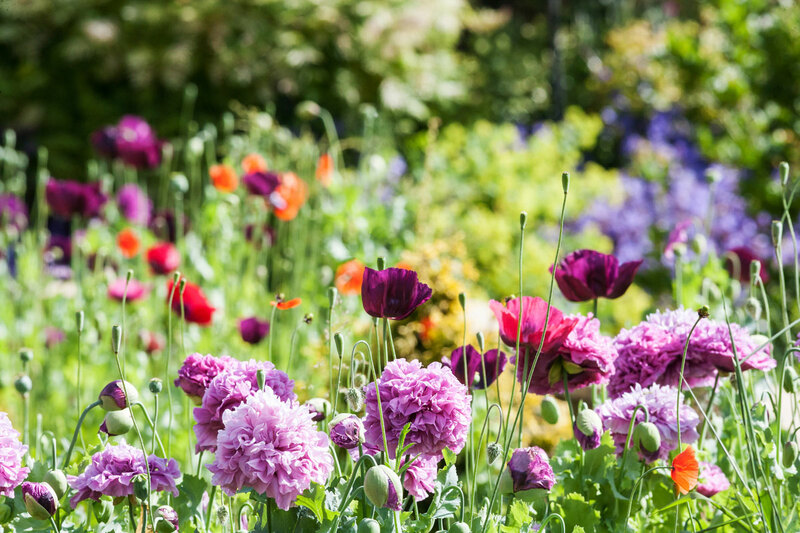 Favorite self-sowing annuals include poppies, nicotiana, borage, aquilegia, forget-me-not, nigella, calendula, clary sage, verbena bonariensis and sweet alyssum. Dahlias Noordwijks Glorie in the foreground, Ginger Willo in the back. No time to fuss with edging, staking and pruning? Perfect! Cottage gardens are supposed to be a bit disheveled. 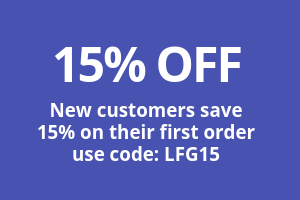 They’re homey and unpretentious; made for exploring. Everyone is welcome to come in, wander around and lose themselves among the plants. 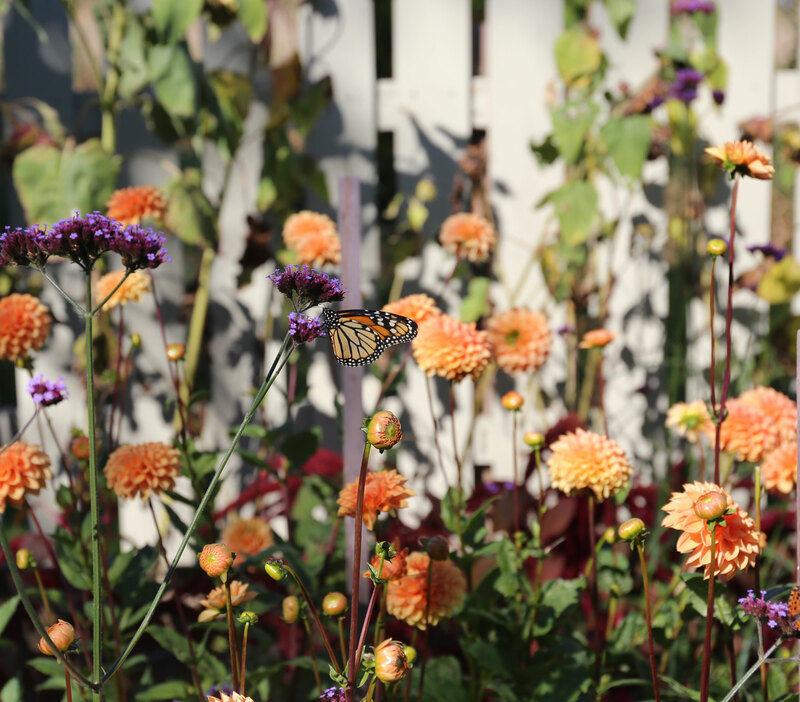 Cottage gardens welcome monarchs and other butterflies. 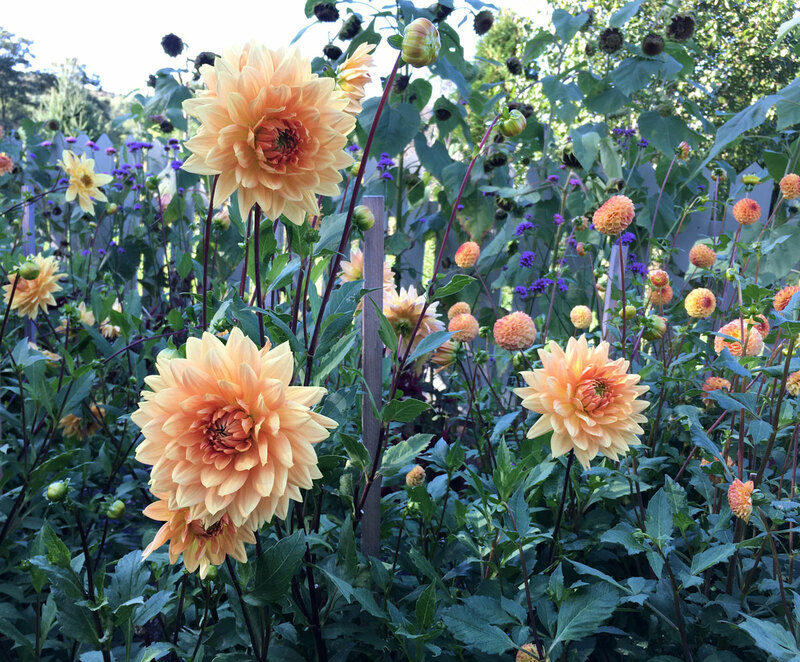 There’s another benefit to a cottage garden’s eclectic assortment of plants. Scientists have documented a correlation between plant diversity and pollinator diversity. Gardens that are crammed with many different plant species attract a wider variety of insect and animal species. These can include native bees, honeybees, butterflies and moths as well as dragonflies, ladybugs, hummingbirds, songbirds, toads and lizards. Gardens that are not orderly and perfectly groomed offer more places for these creatures to find cover and raise their young. Opium poppies self-sow and bloom in many beautiful colors. Cottage gardens rarely have a specific color scheme. Their signature look is a kaleidoscope of hues that change with the season. Can you combine red roses and violet garden phlox with orange poppies? Yes! What about pink hollyhocks, blue bachelor’s buttons and yellow sunflowers? Definitely. Accidental color pairings are one of the unexpected pleasures of a cottage garden. A self-sown red poppy is electrifying as it emerges from a cushion of purple nepeta. A sky-blue morning glory looks especially beautiful when it’s peeking at you from behind a golden yellow sunflower. Flowers are just looking for a place to bloom and cottage gardens welcome them all. Invite a family of wrens to share your cottage garden. In a cottage garden, plants are invited to be themselves. Take a cue from them and introduce some of your own personality. Weave in functional elements like trellises, benches and lighting; decorative objects such as a fountain, birdbath or statue; antiques such as an old weathervane or a vintage watering can; containers, including hanging baskets and window boxes. 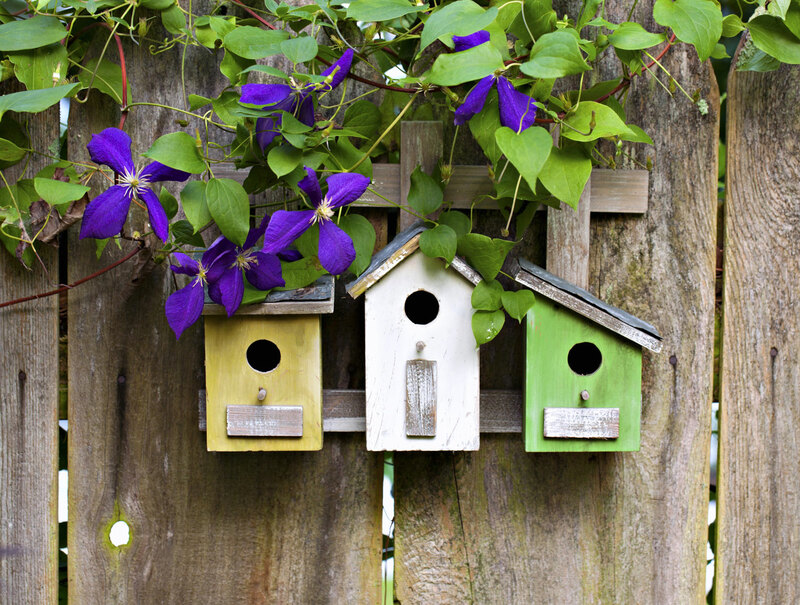 Consider adding a bee hive or a chicken coop. Incorporate features and accessories that make you happy. Be fearless with color. Have fun. 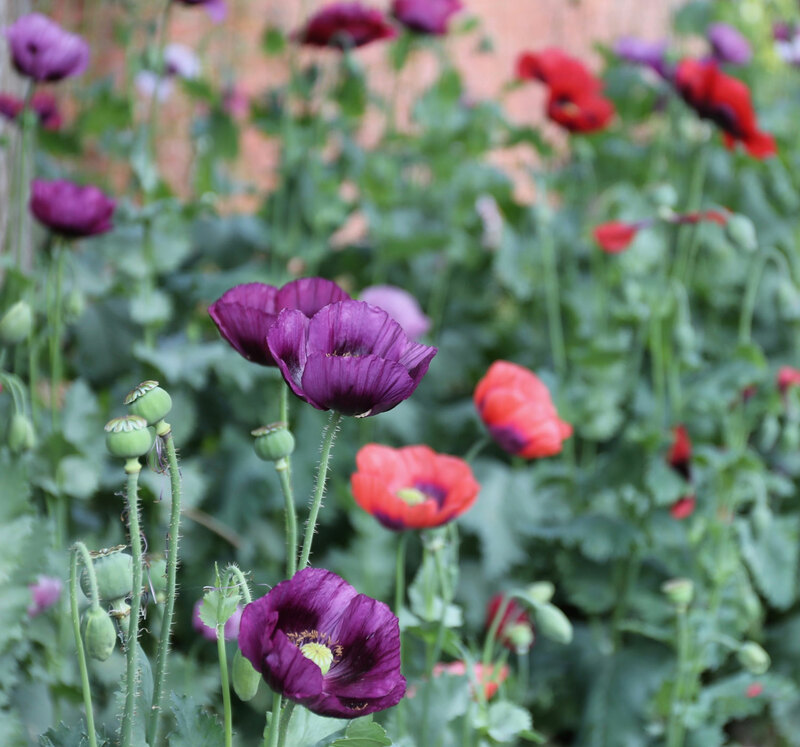 A mix of double and single opium poppies, with Shirley poppies in the background. Though cottage gardens appear to be carefree and self-reliant, they are not maintenance free. 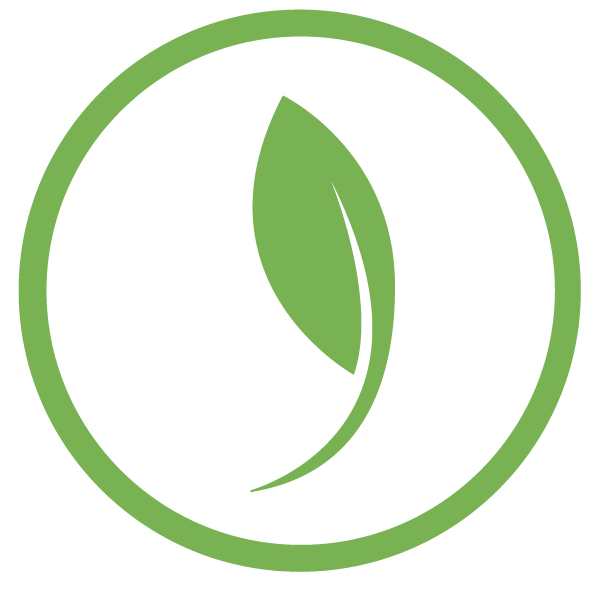 Over time, some plants will inevitably become thugs and squeeze out their neighbors. Self-sowing plants often don’t know when to quit and can get out of hand. Most perennials need periodic dividing to encourage flowering. Bulbs that are not winter hardy and annuals that do not self-seed will need to be replanted each spring. But as with all gardens, tending is part of the experience. It’s how you understand and appreciate each type of plant; how it grows, when it blooms, where it looks best. Some plants you’ll wind up keeping and some you’ll toss. Cottage gardens are meant to evolve!